on the Internet of Things (IoT) becoming a big thing. His famous ability to forecast the evolution of emerging technology weaves a picture of sensors embedded in walls and doors and doorknobs. It makes today’s humble offerings – the likes of remote operation of your house security and appliances or fitness bands that connect to a mobile device and the cloud – seem kinda silly. Marc Andreessen stretches out that belief a little further with his opinion that cell phones will become obsolete. In his perspective a single point of contact such as a cell phone is a limiting vision. He conceptualizes that screens will pervade many more surfaces so much that having to carry your own electronic portal seems a bit ridiculous. That’s an intriguing perspective from an expert on the subject. Goodness knows that a home phone or a pay phone seems quite antiquated today; even paying for a phone call is becoming upended. It’s becoming possible to speak to anyone in the world with an Internet connection and a choice of free apps. So what happens to the countries …or continents … that are amassing mobile service by leaps and bounds but still lagging far behind? Are they going to be left even further behind …again? Will the technology gap drop those that can’t afford the latest and greatest? Africa for example doesn’t have as many mobile devices per capita as the rest of the world, but they do use mobile phones in the din of the more remarkable remote locations. Their mobile technology isn’t so much smart as functionally adaptive, performing the most cursory and vital functions, such as currency, in more creative ways than more technologically adapted regions. So how could it be possible this makes Africa a better candidate to take a technology leap than further advanced countries? Let’s looks at that. 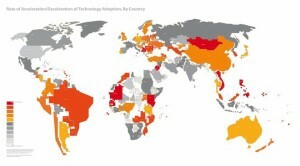 In 2008 Intel reported on their self-developed “Technology Metabolism Index” – a map of what countries adapt technology relative to economics. What they found was that those that “have” don’t necessarily beat out the “have nots” to adopting new technology. The United States had a relatively low index in consideration of the greater resources, access and availability of new technology. 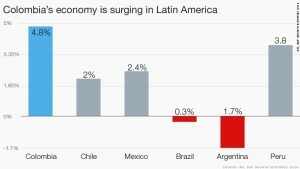 Intel’s Dawn Nafus, a Cambridge PhD, conducted the study in order to better determine the potential of emerging markets versus mature markets. Her team found a couple of surprises. The first is a bit counter-intuitive. Population size is actually a constraint on technology adoption, just the sheer number of connections between people seems to slow adoption. The research also supported that foreign direct investment, or how much money foreign firms pour into a country’s economy, can actually constrain how fast technology is adopted. Again, it’s not what you’d think, when more money usually portends resources and capabilities. So let’s look at another technology adaptor story – Colombia. For years, Colombia was known for illegal drug activity that held it hostage. By investing in technology growth its economy has tripled from what it was 10 years ago and its middle class has increased 50%. The country’s remarkable make over has attracted US businesses, increasing import from the US to Colombia by nearly 400% since 2003. Google, Facebook and Microsoft have established presence in country, and of course, Starbucks is there as well to fuel the creativity. The advances are attributed in great part to fostering entrepreneurship in tech hubs such Ruta N in Medellin and Bogoda’s HubBOG, a 5-year-old tech campus. These hubs are a common theme worldwide. According to the TMI index map, a case could be made for South America, Africa, Eastern Europe or the Far East to make Big Data a turn-around industry for any of these regions or countries within. The availability of Big Data is an inevitable global factor that grows exponentially continuously. Because it is ubiquitous and open source, in Africa or any of the other emerging regions, Big Data is a tremendous opportunity. Big Data is already deployed in multiple directions: competitive industry, government interest and non-government action. Where there is a will, there is a Big Data way. Training and deployment of all levels of Big Data tools are ubiquitous, given connectivity. Big Data has a relatively low cost of entry as well. 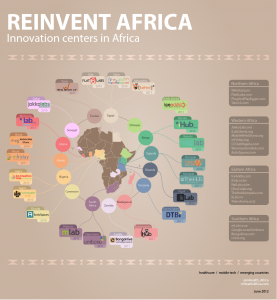 Africa already has a healthy network of these centers. The number of technology centers in Africa has increased dramatically over the past couple of years. More than half of African countries have a technology hub and leader South Africa has nineteen. 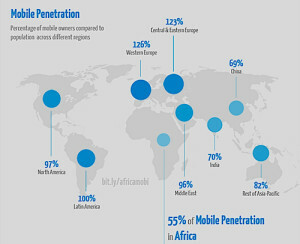 According to World Bank, more than half of African nations have at least one tech hub, totaling around 90. In 2014, investment in tech hubs has gone from $12 to $26 million. A wide variety of participants are needed to make Big Data work. The Big Data industry has an extreme shortage of data scientists and technicians. Even the occupation “data scientist” is actually not as straight forward as it would seem. This is opportunity to find a niche or create a new one. The volume, velocity and variety of data accumulating are a worldwide phenomenon. Perhaps it is relative size, but every person in every country is creating more and more streams of information. In the same thread, every business creates and has access to tremendous amounts of data, but who uses it varies greatly. It’s not a necessity now for entity differentiation, but it is rapidly becoming so. Those that don’t adapt to utilizing Big Data will get left behind – corporation or country. We are in a global economy ecology as well. In a post 9/11 world, we can’t leave others behind and hope for the best. We’ve got to create the rising tide to lift all boats. Bring on the Big Data.